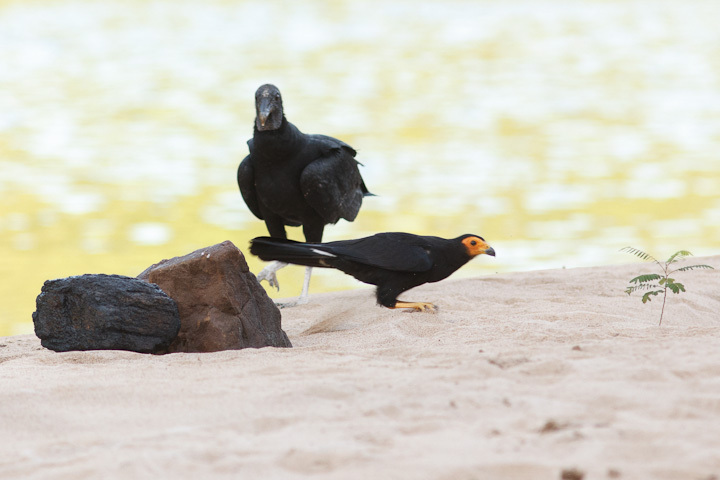 On our 12th day on the Rewa River, I had to part ways with Jonathan, Rambo, Josey and Brian. We headed downriver to where I could meet up with a group of Americans (up to study the Arapaima) who would take me back to Rewa Village. 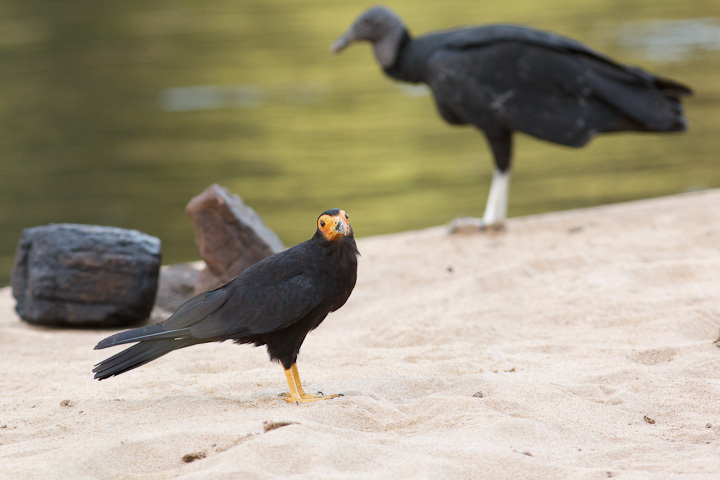 When we met up, we found them sitting at the riverside, having just finished a lunch of piranha. 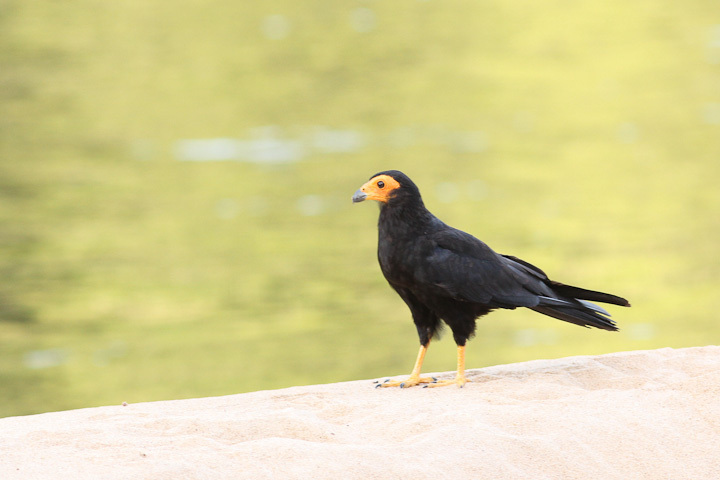 We arranged to meet the next day below the falls, and then bid adieu and went to set up camp. 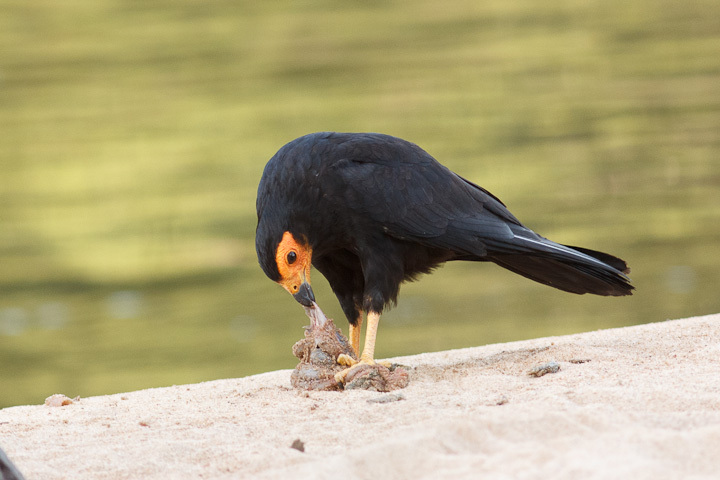 Because there was a pile of fish guts going begging, I placed the pile where a nearby Black Caracara could find it. 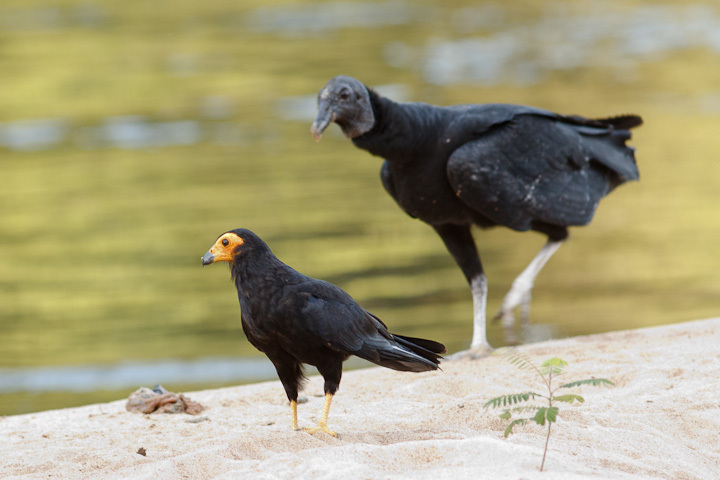 The caracara came in quickly, but just as quickly a much larger Black Vulture came in to drive the little caracara away. 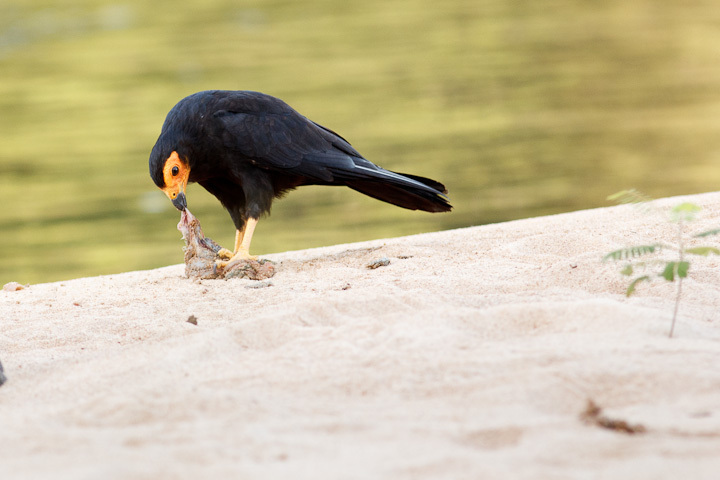 The caracara, after watching the vulture devour the guts, grabs a stray morsel the vulture has left. 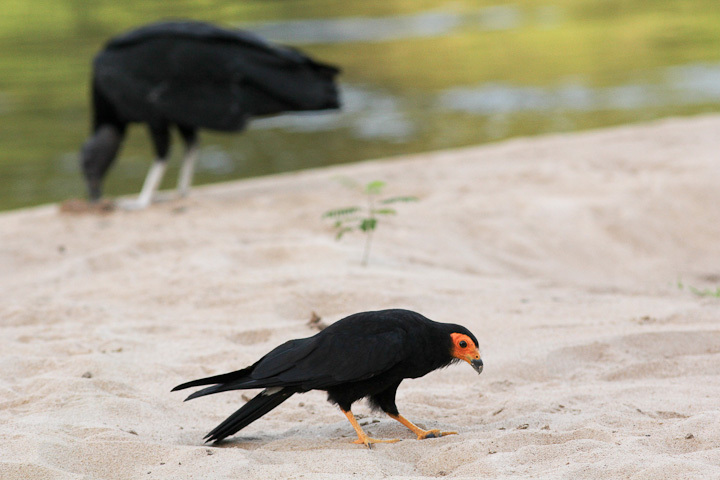 Here the caracara is considering trying for another. Uh oh! 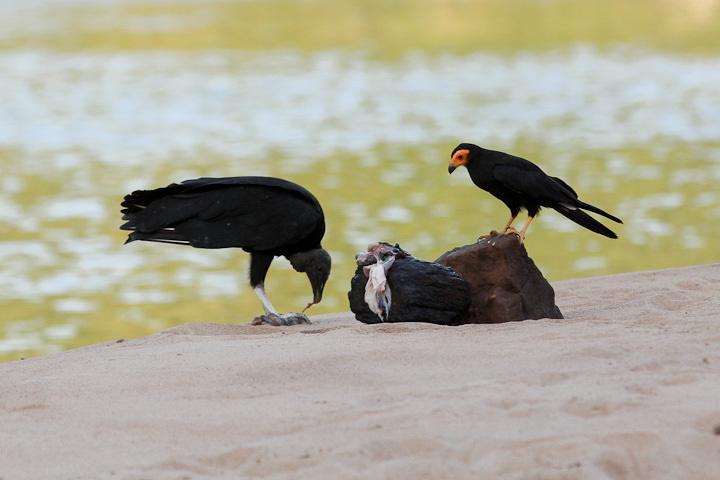 The vulture takes exception to this! 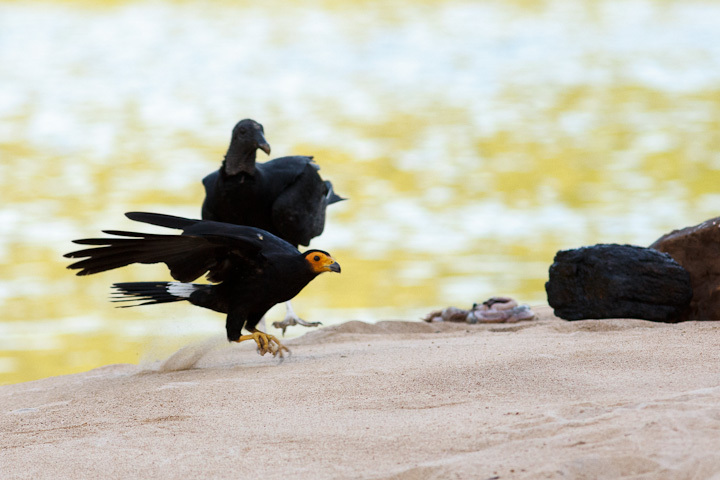 Look at the sand fly as the caracara flees with its modest prize! Speed and agility win the day. 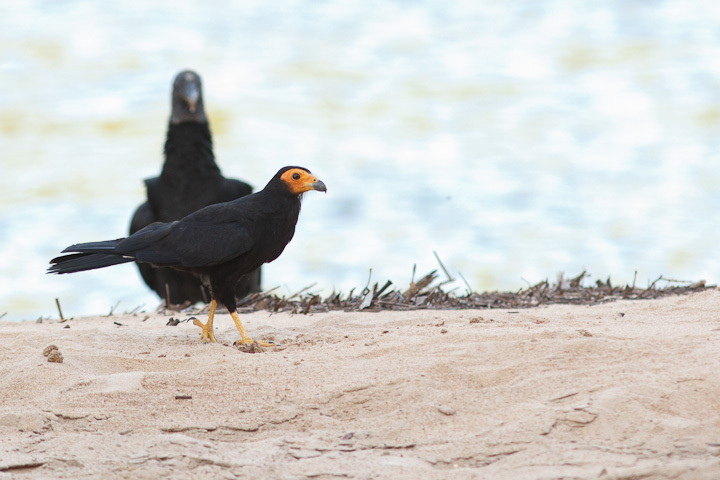 The caracara strikes again during a momentary lapse in the vulture’s attention. 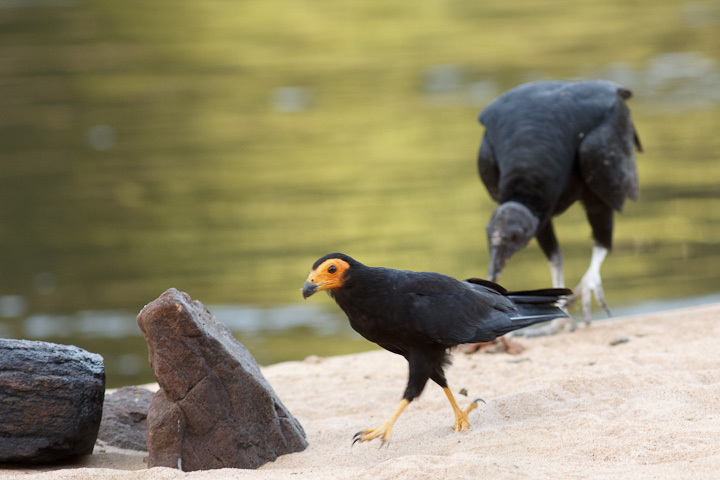 Again, the caracara flees on foot. 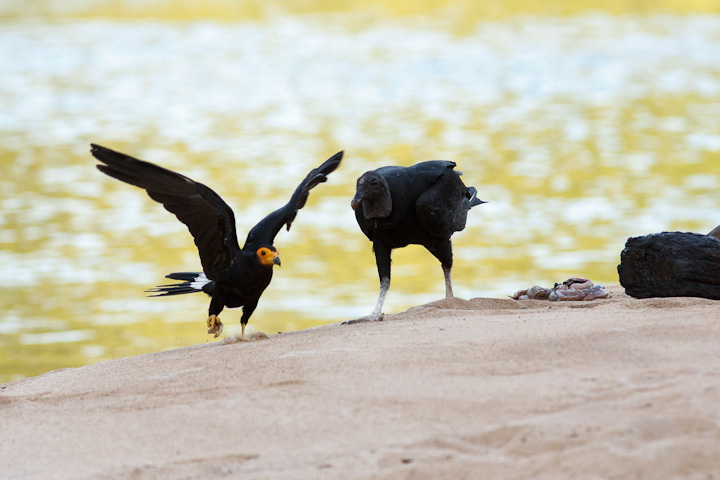 To reward the plucky bird, I chase the vulture off. 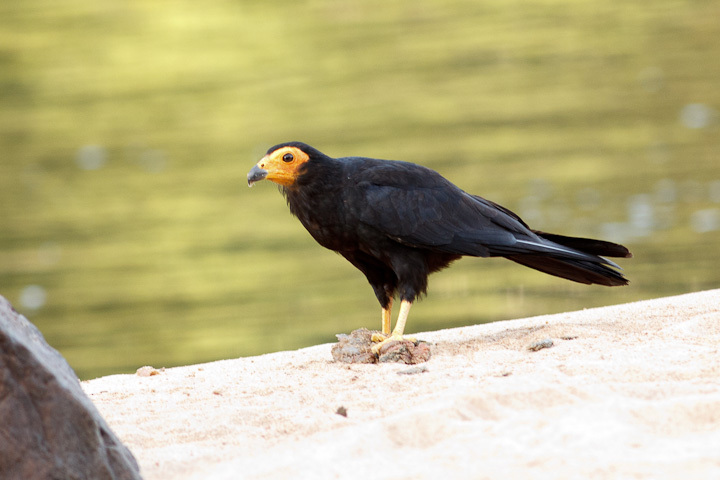 Black Caracara in moment of glory! Oh no! 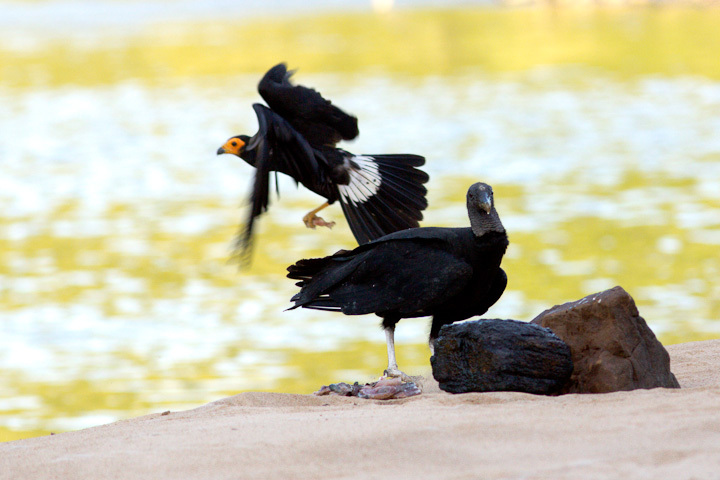 The vulture returns. 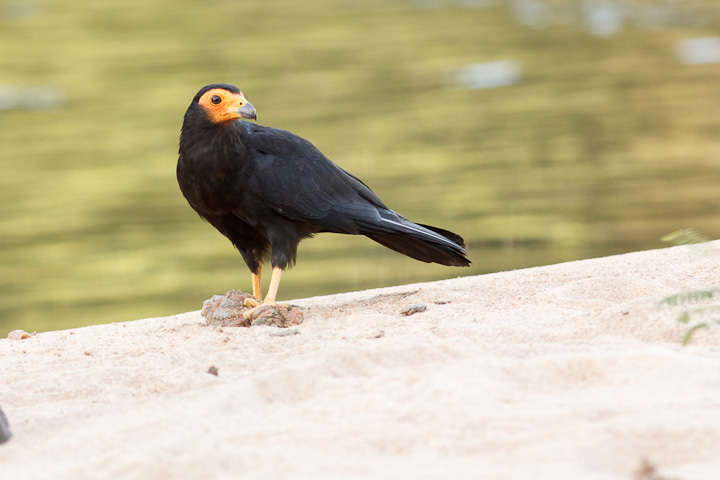 The caracara concedes the fish guts. Then looks to me to see if I will intervene again. 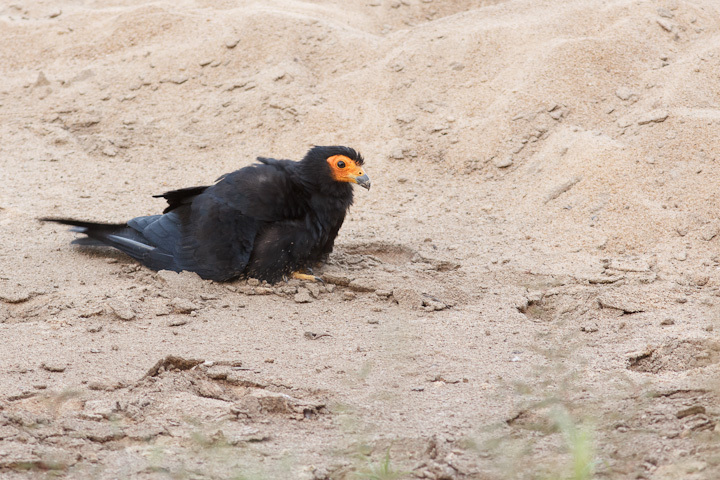 Because help doesn’t seem to be coming, the caracara proceeds to take a few sand baths. 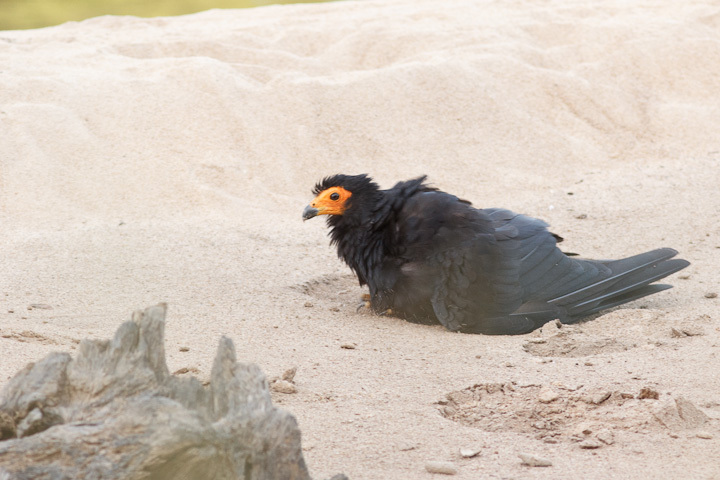 And then a nice lie-down. 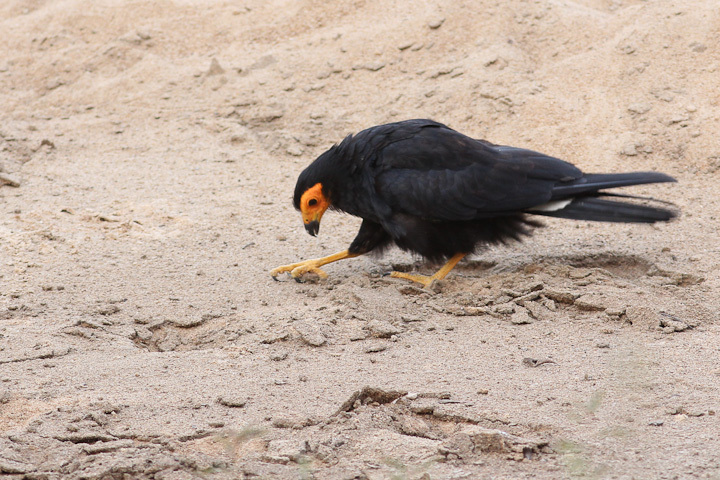 Watching this caracara in action was truly entertaining, and a highlight of the trip for me. 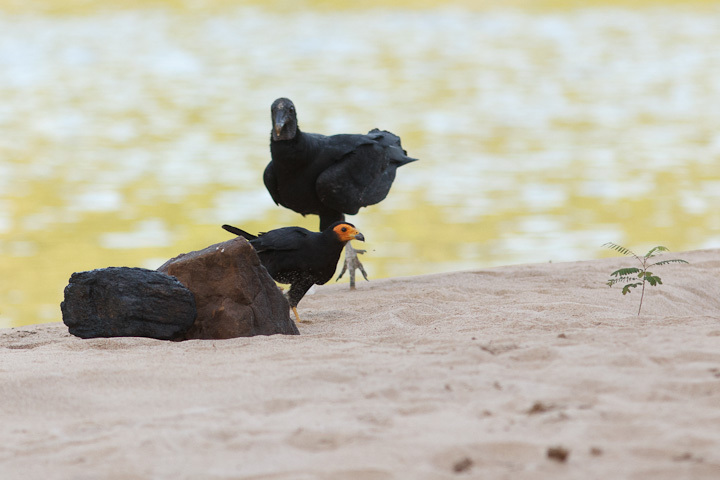 These birds seem very intelligent, associating humans with food, and being attentive to opportunity. 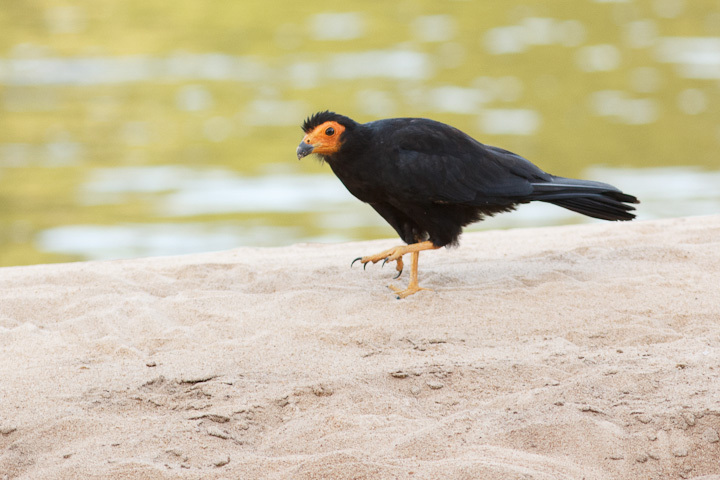 It baffles me that no one has made a concerted study of their biology and behaviour yet. I can’t wait to get back to visit them again sometime! Sheese, no comments? Just noticed there was none. Well, even if I only comment in bursts, I do read your posts and enjoy them. 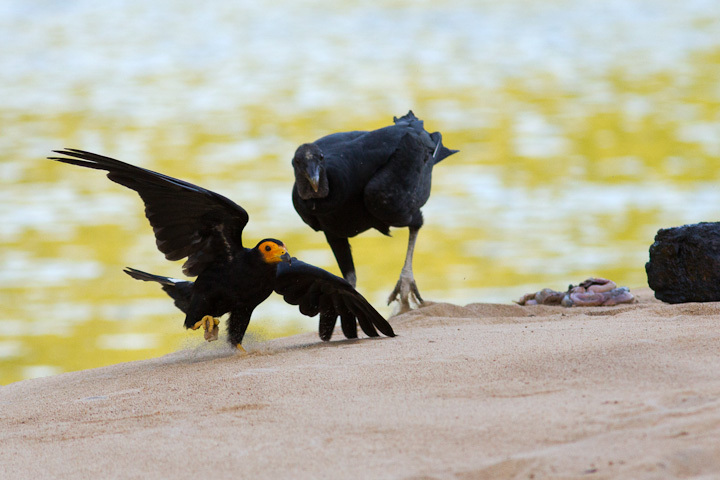 I’d much rather have your interesting photos, even if not National Geographic caliper, with your entertaining commentary than some of the others. It’s obvious you enjoy your subjects as much as I do reading about them. Thanks! I get what I get and I get out often! 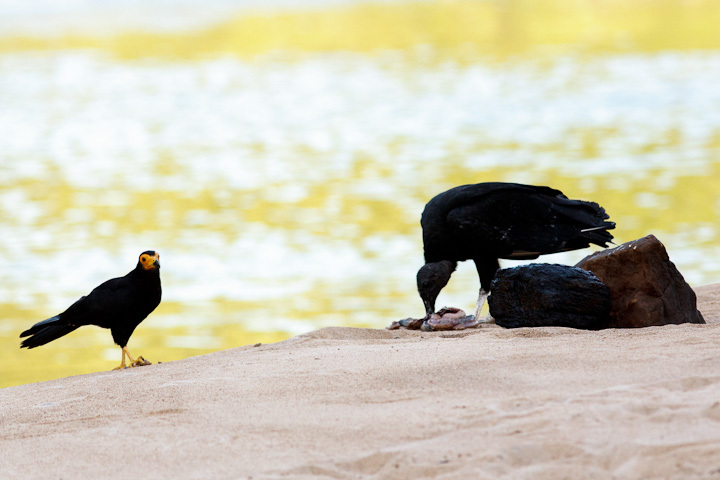 National Geo quality results take time and dedication, and this kind of photography (a river journey) does not really lend itself to that. 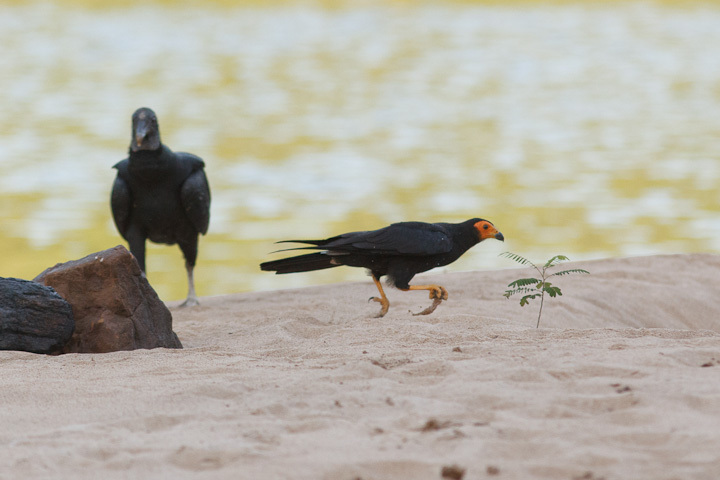 If I had the resources (time and/or money) I could do these subjects much more justice!